Visible crew/equipment: During the final fight, a steady cam operator with a white shirt and black straps around his body is seen during several wide angles. This is not a TV camera, it is a film crewmember. The Director even admits to it in the audio commentary on the DVD. 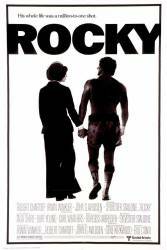 Other mistake: About half way through the movie, Adrian gives Rocky a dog (Butkus). The second time Rocky goes to the meatpacking plant, the dog is with him when he walks in, but he walks out alone and the dog is not seen again in this movie. Revealing mistake: At the end of the movie when Adrian is climbing into the ring, Rocky turns to her and for a very short time you can see the line between the make-up appliance used on his right eye to make him look beat up and the skin of his right cheekbone as well. Continuity mistake: In the last fight, several punches are used twice, shot from different angles. Continuity mistake: There is a dartboard in Rocky's apartment. During a touching scene between Adrian and Rocky, you can see the darts on that board change position/number between shots. No one is playing darts at the time. Continuity mistake: In the last fight scene, particularly during the close-ups of the fighters, you can clearly see in numerous shots that the auditorium seats are empty. This is contrasted with the earlier shots where it is jam packed as the fighters are entering the ring. Continuity mistake: In the scene where Adrian is waiting for Rocky as he is returning home, she is going to surprise him with a gift, Butkus the dog. Rocky is standing about 25 feet from her so he has a good angle to see the entire porch. When she presents him with the dog, he acts surprised like he didn't see him on the side of the cement porch. Plus she is holding the dog leash in her hand. Rocky would have seen the dog immediately. Suggested correction: As pointed out several times before, breath showing in the air is about humidity, not temperature. See Alien vs Predator for similar corrections. This is a misunderstanding about how humidity plays a role in seeing your breath. If the relative humidity of both your breath and air outside combined is 100%, you'll see your breath, this means you can see your breath at higher temperatures. To reach 100% relative humidity, the outside humidity needs to be higher or the temperature needs to be lower. However, at a certain temperature (usually around 45°F), you'll always see your breath. So at 28°, you'll always see your breath, no matter what the humidity is. This is a valid revealing mistake. Visible crew/equipment: As Rocky is talking to Mickey in the locker room after his locker has been taken over by another boxer, you can see the shadow of the boom mic on the locker behind him as it dips in and out of view. As he starts walking away, you can also see it as it follows him. Other mistake: When Adrian is in Rocky's apartment, he tells her that he no longer has a phone. Several scenes later when Rocky confronts Paulie for bringing reporters to the meat company, he tells Paulie that he should have called him first or left a message. New this month Suggested correction: Rocky also demonstrates that he can "call" Paulie by yelling out his window. Rocky also gets messages at Mickey's gym, much to Mickey's chagrin at not being Rocky's messenger service. Continuity mistake: Tony, Apollo's trainer, gets into the ring twice at the end of the last match. Audio problem: At the end of the fight when Apollo tells Rocky there won't be a rematch, his lips aren't moving. Rocky's lips aren't moving either when he says "Don't want one!" Continuity mistake: In Rocky's first match at the church, when he gets to his corner a towel on the ropes disappears. Continuity mistake: Around the beginning while Rocky stops by at Adrian's store, she has 3 boxes which become blue cylinders. Continuity mistake: While Rocky is getting money from a guy, he drives a green cart and is wearing a helmet that disappears between shots. Paulie: I want you outta here instamatically. 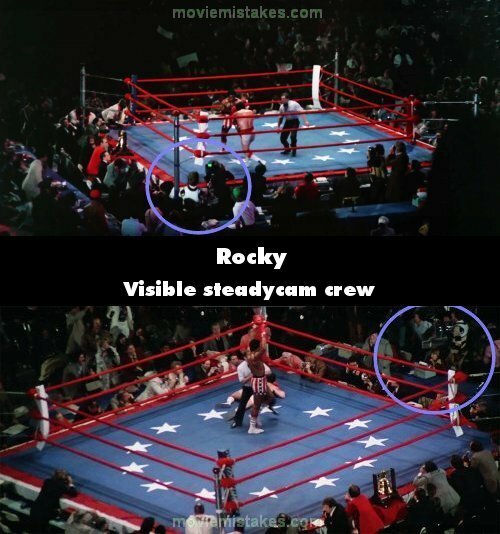 During the scene before the fight, where Rocky enters the ring and sees the 2 portraits of him and Apollo, the error on Rocky's shorts was an actual error made by the art crew, and Sylvester Stallone rewrote the scene when he saw this mistake.